Professional tree surgery services in the North East of Scotland. Treeworks Moray is pleased to be able to provide a variety of tree surgery services to the Moray area and beyond. 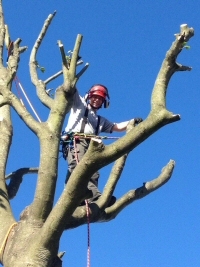 As tree surgeons, we take pride in supplying you with a professional and safe service from start to finish. To ensure your piece of mind all operators are trained to City and Guilds/NPTC standards in chainsaw and tree operations, as well as holding IPAF certification for MEWP's (Mobile Elevated Work Platforms). Plus, Treeworks Moray staff are covered by Public Liability insurance to £5m, so should anything go wrong you can be assured that we will take care of it.